Create a Lexicon of Sentiment words using Word2Vec and Glove. The package can be used from the Weka GUI or the command line. Note: The following examples work with the newest version of the package. Note: The -Xmx parameter allows incrementing the memory available for the Java virtual machine. It is strongly recommend to allocate as much memory as possible for large datasets or when calculating large dimensional features, such as word n-grams. More info here. Open in the preprocess panel the sent140test.arff.gz dataset located in HOME/wekafiles/packages/AffectiveTweets/data/. Note: Select arff.gz files in the Files of Type option. Train an SVM using LibLinear. Go to the classify panel and select the target class as the variable (Nom) class. Note: Weka allows copying and pasting the configuration of its objets. This is very convenient when training complex schemes with various parameters. The FilteredClassfier allows directly passing a filter to the classifier. In this example, we are removing the attributes of type string. Select the Percentage split option and start training the classifier. Note: This example is also shown in video 1. Go back to the preprocess panel and press the Undo button to go back to the original dataset (or load the sent140test.arff.gz dataset in case you skipped the first example). Note: replace $HOME by your home directory (e.g., /home/felipe). We are using the MultiFilter filter to nest multiple filters. The Reorder filter is used to discard the first two String attributes and moving the class label to the last position. Now you can train the classifier by pressing the Start button. Open in the preprocess panel the unlabelled.arff.gz dataset of unlabelled tweets. weka.filters.unsupervised.attribute.TweetCentroid -C -W -F -natt -M 10 -N 10 -H $HOME/wekafiles/packages/AffectiveTweets/resources/50mpaths2.txt.gz -stemmer weka.core.stemmers.NullStemmer -stopwords-handler "weka.core.stopwords.Null " -I 1 -U -tokenizer "weka.core.tokenizers.TweetNLPTokenizer "
weka.filters.supervised.attribute.AddClassification -remove-old-class -distribution -W "weka.classifiers.meta.FilteredClassifier -F \"weka.filters.unsupervised.attribute.RemoveType -T string\" -W weka.classifiers.functions.LibLINEAR -- -S 7 -C 1.0 -E 0.001 -B 1.0 -P -L 0.1 -I 1000"
Save the resulting lexicon as an arff file by clicking on the save button. Use your new lexicon on a different tweet dataset using the TweetToInputLexiconFeatureVector filter. Note: This example is also shown in video 2. Open in the preprocess panel the sent140train.arff.gz dataset. This is a large corpus, so make sure to increase the heap size when running Weka. Create a PMI lexicon using the PMILexiconExpander filter with default parameters. This is a supervised filter. 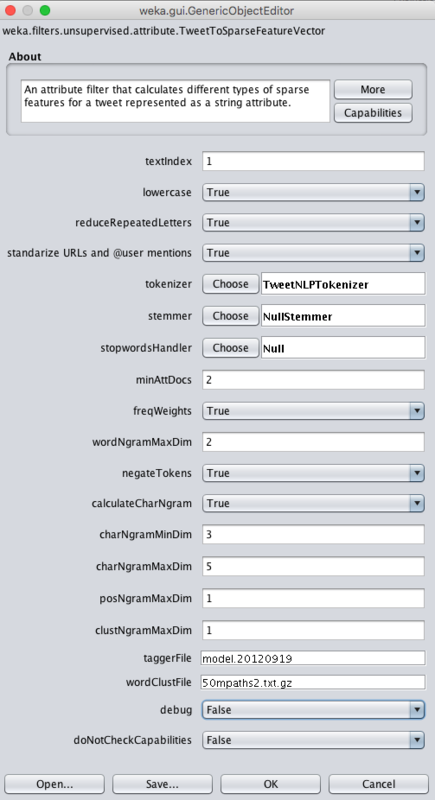 Save the lexicon as an arff file and use it with the TweetToInputLexiconFeatureVector filter. Distant supervision is very useful when tweets annotated by sentiment are not available. In this example we will show how to train a classifier using emoticons as noisy labels. weka.filters.unsupervised.attribute.LexiconDistantSupervision -lex $HOME/wekafiles/packages/AffectiveTweets/lexicons/arff_lexicons/emoticons.arff -polatt polarity -negval negative -posval positive -removeMatchingWord -I 1 -tokenizer "weka.core.tokenizers.TweetNLPTokenizer "
Note: This example is also shown in video 3. In this example we will generate positive and negative instances from a corpus of unlabelled tweets using the ASA and the PTCM methods. The classifier wil be evaluated on positive and negative tweets. Note that the values for the class are empty for all instances. We are adding these labels to make the data compatible with the target tweets on which the classifier we will train will be deployed. Note: These examples are also shown in video 3. The same classification schemes can be run from the command line. java -Xmx4G -cp weka.jar weka.Run weka.filters.unsupervised.attribute.TweetToInputLexiconFeatureVector  -i  $HOME/wekafiles/packages/AffectiveTweets/data/sent140test.arff.gz -o proc_data.arff -lexicon_evaluator "affective.core.ArffLexiconEvaluator -lexiconFile /Users/admin/wekafiles/packages/AffectiveTweets/lexicons/arff_lexicons/NRC-AffectIntensity-Lexicon.arff -B NRC-Affect-Intensity -A 1 -lex-stemmer weka.core.stemmers.NullStemmer" -stemmer weka.core.stemmers.NullStemmer -stopwords-handler "weka.core.stopwords.Null " -I 1 -U -tokenizer "weka.core.tokenizers.TweetNLPTokenizer "
Then, convert the new feature vector into a CSV file. More information about how to run filters from the command line on the test data can be found here. In order to train deep learning models with AffectiveTweets you first need to install the WekaDeepLearning4j package, which is a wrapper of the DeepLearning4j library. The package can be installed by following the instructions from here. Some examples instructions using the two packages together are given below. Dl4jStringToGlove: calculates word embeddings on a string attribute using the Glove method. Use these filters in an analogous way as the TweetCentroid filter and then following the same steps as the example from here. In this example we will show how to train a convolution neural network with a similar arquitecture to the one used in this paper from the Weka GUI. weka.filters.unsupervised.attribute.TweetToEmbeddingsFeatureVector -S CONCATENATE_ACTION -embeddingHandler "affective.core.CSVEmbeddingHandler -K $HOME/wekafiles/packages/AffectiveTweets/resources/w2v.twitter.edinburgh.100d.csv.gz -sep TAB -I last" -K 15 -stemmer weka.core.stemmers.NullStemmer -stopwords-handler "weka.core.stopwords.Null " -I 1 -U -tokenizer "weka.core.tokenizers.TweetNLPTokenizer "
Note: This code is not compatible with the latest version of the WekaDeepLearning4j package. This network has 100 filters in a convolutional layer, followed by the output layer. The filter size is 300x1 (i.e, each filter maps a word trigram, since each word has 100 dimensions). The stride is 100x1 (the number of dimensions for a word). The number of epochs is 200. The input width is 1500 and the input height is 1. The number of input channels is 1 and the batch size is 256.